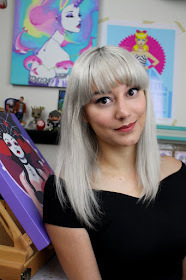 Art NuVogue: Developing Your Own Drawing Style! I discover your blog that I like so much! adventures and very beautiful photographs of yours aquarelle, great work ! I've always loved and do it as a hobby. Also, this is me a bit trying to create my own drawing style. Thanks! Really interesting article and video been pondering the developing own style question for quite some time myself. Also checked out your art on Etsy, really like Flora and Fauna and Kali (of course all the rest also very good, they are just my favourites).